Approximately one third of the population suffers from some type of sleep problem. These problems range from difficulty falling asleep, known as insomnia, to excessive daytime sleepiness. The indirect cost of sleep disorders is estimated at 41 billion dollars per year from lost productivity, 17 to 27 billion dollars per year from motor vehicle accidents, 7 billion dollars per year in work-related accidents and 2 to 4 billion dollars per year in home and public accidents (Stoller MK Clin Ther 1994:16 873-897). These figures do not even take into account the added morbidity caused by the physiologic impact from sleep disorders. Unfortunately, Sleep, a process which consumes about one third of our life and which has a spectrum of abnormalities which can hinder our daily living, has received so little attention in our medical education system. Unfortunately, most physicians have not been trained to deal with these common problems. A study done in 1990 demonstrated that an average of only two hours are spent during the four years of medical school teaching medical students anything about sleep. This has created a significant deficit in our current medical system. Most people have a physician who they can refer to as their primary care physician. Particularly with current health care plans, patients must identify a physician who takes a leading role in directing the overall health management for a patient. Unfortunately, most of these physicians have not received any training on identifying or treating sleep problems. If the physician were to add just a few screening questions related to sleep to their routine screening assessment, millions of Americans would be guided into a systematic pathway which could improve their sleep ills. This summary is intended to provide the primary care physician with practical information that can be easily implemented to screen patients for common sleep disturbances. The basics of taking a "sleep" history along with an appropriate questionnaire are presented in detail in the sections to follow. A decision matrix (Fig, 1) is provided at the end which outlines a logical approach to providing care for patients with sleep disorders. A good starting point is to recognize that what occurs during the day can affect the sleeping process. Likewise, what occurs during sleep can affect our daytime function. Whether you are awake or asleep there are two competing processes interacting within us. The balance--or lack thereof-- between these two processes determines whether you are awake or asleep. One physiologic process is called the sleep drive. The other is called the wake drive. Under normal conditions, in the morning our sleep drive is low and we have no problems staying awake. As the day progresses, our sleep drive increases until night time when it becomes extremely high. As a result, our sleep drive becomes stronger than our wake drive and we go off to sleep. As we sleep, our sleep drive becomes lower as we gain the sleep we need. Toward the morning, our sleep drive has become so low that we wake up. Then the process repeats itself. If a patient has fragmented, inefficient sleep, he/she is likely to suffer from daytime sleepiness and fatigue. The fragmented sleep does not lower the sleep drive during the night and as a result the person caries around an excessive amount of sleepiness during the day. Many patients with this problem are in denial, in spite of recurrent difficulties with sleepiness while driving or while sitting quietly in business meetings. The stresses of the day can lead some individuals to have a difficult time settling down in the evening. In essence, the stress and anxiety raises the wake drive and disturbs the balance with the sleep drive, and the person is unable to fall asleep. This can lead to insomnia. The brain can not transition into sleep if it is overly activated. Emotions and stress can be a source of this activation, making it difficult to fall asleep. Therefore the "sleep history" must cover aspects of a typical 24-hour period of a patient. The physician taking the history should ask questions that characterize the patient's typical 24 hour day. It is paramount to categorize patients' sleep complaints into those with excessive daytime sleepiness (EDS) and those without. To simply ask "are you sleepy during the day" may not be sufficient. Many patients do not recognize the sleepiness from which they suffer, and mask the symptoms by keeping active and moving around in order to stay awake. A standardized sleepiness scale which consists of a set of specific questions (Epworth Sleepiness Scale) can be used to help identify and quantify hypersomnolence. In order to prevent patient denial from producing false negative results, it may be helpful to have a spouse also respond to the questions to confirm negative responses. How likely are you to become drowsy or fall asleep during the day in the following situations, in contrast to feeling just tired? The responses to the questions are from 0 to 3. Adding up the total from all of these questions provides a number from 0 to 24 with 10 or higher considered to be reflective of daytime hypersomnolence. It should be recognized that patients frequently exhibit denial or underestimate their daytime dysfunction, so the responses from such a questionnaire should be evaluated with caution. If the patient has daytime sleepiness then the etiology of this problem should be determined in the following manner; First, assess the patients total sleep time. If the patient only allows 4 to 5 hours for sleep per night then clearly that would be the first consideration as a cause of EDS. This condition of poor sleep hygiene is referred to as Insufficient Sleep Syndrome (ICD# 307.49-4). It results from a lack of proper sleeping time. A clue to this diagnosis would be the patient who uses weekends and holidays to "catch up on sleep", with longer sleeping intervals and adequate resolution of daytime sleepiness after correcting for this sleep loss. If insufficient sleep syndrome has been excluded as a cause for a patient’s complaint of EDS then consider that the patient may have inefficient sleep due to a physiological abnormality. Usually inefficient sleep is a result of frequent arousal's or micro-arousals throughout the night. Some of the most common causes for these arousals are obstructive respirations (Obstructive Sleep Apnea (OSA) ICD# 780.53-0) and periodic leg movements of sleep (PLMS). A sleep study (Nocturnal PolySomnoGram - (NPSG)) provides the information necessary to identify the presence of these and other abnormalities. It is important to obtain a full PolySomnoGram in order to characterize a patient’s sleep physiology. Many "sleep recorders" currently on the market only provide limited nocturnal respiratory monitoring and are unable to identify the presence of micro-arousals because they do not measure brain electrical activity (EEG). Some claim to measure arousals with heart rate variability, but this technique alone is insufficient. As an example in patients with an autonomic neuropathy (common among diabetics) the heart rate variability may be lost. If the patient complains of snoring ask if a bed partner has witnessed pauses in breathing during sleep. This will provide further insight into establishing a diagnosis of a sleep related breathing disorder. An important point must be made regarding the lack of observed pauses in breathing during sleep. It has become increasingly clear that the established criteria of a 10 second pause, or 10 second reduction in airflow, as measured by the thermistor or thermocouple, which defines obstructive apnea and Hypopnea respectively, are not adequate parameters for identifying all clinically significant obstructive respirations during sleep. Recent reports describe the presence of partial upper airway obstructions, which result in increased workload of breathing during sleep. This precipitates brief arousals without measurable changes in the standard airflow sensors or strain gauges routinely used for polysomnography, or finger pulse oximetry. Frequently these episodes of increased respiratory effort can be detected with a microphone which measures the magnitude of snoring. A common pattern in which snoring increases in a crescendo fashion ultimately associated with an arousal, and brief termination in the snoring, is a sign of these effort related arousals. These repetitive arousals can occur without meeting the standard criteria for Hypopnea or apnea on NPSG testing. Studies, which employ esophageal pressure monitoring as an indirect method of obtaining pleural pressures, demonstrate these episodes of increased Intrathoracic negative pressures which result from the increase in upper airway resistance associated with partial airway obstruction. This increased negative pleural pressure culminates with an arousal, as noted in the EEG signal, which is associated with increased muscle tone of the upper airway, reducing the upper airway resistance. With improved airway potency, the patients fall right back to sleep and the cycle repeats itself again in a semi-periodic fashion. This abnormal phenomenon has been referred to as the Upper Airway Resistance Syndrome. This new diagnosis does not yet have an ICD code, but it is best to categorize it with Obstructive Sleep Apnea. Therefore, if a patient has EDS but no significant apnea or Hypopnea, there is still the possibility that the patient may suffer from Upper Airway Resistance Syndrome, Idiopathic CNS Hypersomnolence, or even Narcolepsy. To objectively exclude the possibility of the Upper Airway Resistance Syndrome the NPSG would need to be performed with an esophageal pressure monitor for measuring the Intrathoracic pressures associated with respiration. During review of these enhanced NPSG studies an association is sought where crescendo increases in negative pressures precede arousals. The addition of esophageal pressure measurements to the NPSG study has not become common place as of this time, but it is clearly recognized that this method is superior to the stands used for routine NPSG recordings. Recording snoring, or tracheal sounds, is one way to infer the presence of the upper airway resistance syndrome. If snoring is present then the diagnosis of the upper airway resistance syndrome may be detected by a crescendo snoring pattern similar to the more specific pressure measurements. If the patient does not snore then objectively making this diagnosis becomes almost impossible without pleural pressure monitoring in conjunction with the routine NPSG study. What to do for a patient whose only complaint is snoring? Even if a snoring patient has not been witnessed to have pauses or abnormal breathing during sleep, most likely these observations are made at the beginning of the sleeping period, when a bed partner is still awake. Most patients with obstructive respirations have their worst respirations during REM, and most of the REM sleep occurs during the last portion of the night. REM episodes become longer as the night progresses with each sleep cycle. The hypotonia of REM results in vulnerability of the airway to collapse. It is during these early morning hours that the bed partner may also be asleep and therefore unable to witness any apnea events (occult apnea). Therefore, it is not adequate to rely on a bed partner's observation to exclude a diagnosis of sleep apnea. Even if the patient only complains of snoring, a sleep study is important to evaluate the degree of obstructive respiration before embarking on treatment methods. If there is no evidence that the patient suffers from daytime sleepiness or fatigue then the question is if the patient has occult obstructive sleep apnea which may pose an increased risk for cardiovascular or cerebrovascular disease ... etc. There is less concern with regards to the degree of micro-arousals in this situation since; the patient does not have daytime sleepiness or fatigue. Even if arousals were present to a high degree, patients resilient to the ill effects of sleep fragmentation may not suffer from excessive daytime sleepiness. Not everyone is equally sensitive to the ill effects of sleep fragmentation. Therefore, in the absence of daytime sleepiness and few risk factors for sleep apnea, a snoring patient may not need a full PolySomnoGram for evaluating sleep, and a more refined respiratory monitoring study may be utilized for the "screening" of occult moderate to severe obstructive sleep apnea. If obstructive sleep apnea is not identified from the "screening" study in a patient with no other sleep complaint, other than snoring, and NO daytime sleepiness, then treatment can be directed to correct the snoring alone (i.e. such as laser assisted uvuloplasty or a mandibular advancing dental appliance). On the other hand, if obstructive sleep apnea is identified then a more aggressive treatment approach can be instituted, such as nasal CPAP (continuous positive airway pressure). Although the laser assisted uvuloplasty and dental appliances have been utilized in the treatment of OSA they have not demonstrated an overall success rate as high as nasal CPAP. For snoring alone, in the absence of Obstructive Sleep Apnea, a new procedure called Somnoplasty, has become available. This treatment utilizes a needle, which is inserted into the soft palate and uvula, which emits microwave energy. This results in creating a lesion within the soft tissue, which when healing, causes retraction of these structures and helps prevent snoring. There are numerous problems that can develop in patients with obstructive sleep apnea. The most common signs and symptoms frequently recognized by physicians are loud snoring, and daytime sleepiness. There are many other medical conditions that have recently been linked with obstructive sleep apnea as well. Nocturnal gastric reflux is a commonly over looked problem associated with OSA. It seems that the large negative Intrathoracic pressure produced during obstructive respiration results in suctioning of gastric secretions into the esophagus. Treating patients with nasal CPAP has been demonstrated to significantly improve these gastric complaints. Congestive heart failure, hypertension, and risk of cerebral vascular disease have all been recently shown to worsen with obstructive sleep apnea. In the most conservative of situations, it would be appropriate to screen all patients with hypertension, who snore, for OSA. If a patient is diagnosed with significant obstructive respirations during sleep then consider treating with positive pressure therapy (i.e. CPAP), at least as an initial intervention. This way the patient can receive the optimal treatment and resume normal daytime functioning. The key to successful positive pressure therapy is 1) proper introduction of this treatment to the patient by the physician, therapist, or sleep technician, 2) identifying the correct pressure which prevents the airway obstruction without being so high as to precipitate arousals, and 3) recognizing the common pit falls of treatment, and establishing a solid follow up program to address the issues of compliance and correcting the minor problems which commonly creep up with this type of treatment. Identifying the proper positive pressure is achieved during a "titration" sleep study. During the titration study all of the sleep parameters are monitored and various pressure settings are administered in order to identify the optimal pressure settings which keeps the airway open without disturbing sleep. It is clearly recognized that mandibular position plays a significant role in the development of obstructive respirations during sleep in the upper airway. If the mandible is kept forward this can help and even prevent OSA in some patients. Mandibular advancing dental appliances have been developed which take advantage of this principle. These appliances can improve, and completely prevent, sleep apnea is many patients. This same microwave technique (Somnoplasty) mentioned above is now being used on the base of the tongue to shrink the tongue bulk for the treatment of Obstructive Sleep Apnea. This is a new technique, which deserves further consideration, and may ultimately become a widely utilized procedure. More extensive surgical procedures have been extensively evaluated in the past and have also demonstrated improvement in OSA, but these are widely utilized because of the invasive nature of these approaches. Unfortunately surgery on the Uvula and soft palate alone is not adequate for the majority of patients. The more extensive procedures involve the tongue, mandible, and maxilla in some cases. To evaluate for Narcolepsy ICD #347, the history should consist of several characteristics in addition to hypersomnolence. These are 1) Cataplexy, 2) Sleep paralysis, and 3) Hypnogogic hallucinations. Of these, only cataplexy is specific to Narcolepsy. The other features can all be found in other disorders. Narcolepsy is a disorder of REM sleep. Patients with Narcolepsy have an enhanced tendency to go into REM sleep. One of the features of REM sleep is muscle paralysis. This is mediated by a cholinergic system in the brain stem. In Narcolepsy, this system becomes activated during the day, triggering the muscle paralysis system and causing cataplexy (sudden loss of muscle tone). Cataplexy is usually triggered by an emotional event such as laughter or being frightened. A typical example is the Narcoleptic who, when laughing, begins to become weak in the knees and needs to hold onto something for support in order to remain standing while laughing. Treatment of cataplexy is usually achieved with tricyclic antidepressant medications such as Clomipramine. These medications have anticholinergic properties as well as enhanced seratonergic and noradrenergic effects which in turn suppress the motor paralysis phenomena of cataplexy. To establish a diagnosis the patient should have a Multiple Sleep Latency Test (MSLT). This test consists of 4 or 5 napping sessions throughout the day at two hour intervals. The patient is asked to fall asleep for each of these naps. The average time it takes to fall asleep is tabulated. Abnormality is graded into severe (less then 5 minutes), Moderate (5 to 10 minutes), or mild (10 to 15 minutes) to fall asleep. In addition the test determines of the patient goes into REM sleep with 15 minutes of falling asleep. For a MSLT to be consistent with a diagnosis of Narcolepsy then the patient should go into REM sleep in at least two of the napping sessions. An overnight Polysomnogram must be done the night before the MSLT in order to determine if there is any other abnormalities causing the sleepiness, and to make sure that the patient has at least six hours sleep the night prior to the MSLT. If the NPSG does not show any abnormalities and the MSLT is positive for EDS but there are no REM episodes, then the patient is diagnosed with Idiopathic CNS Hypersomnolence ICD #780.54.7. To best understand this disorder, it is best to think of an individual who has easy tendency to fall asleep resulting from inherent factors rather than disturbed sleep. The only way to treat the hypersomnolence of both Narcolepsy and Idiopathic CNS Hypersomnolence is with stimulant medications. Stimulants can change these patents from disabled to highly functioning individuals. Scheduled naps can help, particularly in Narcoleptics, but medication is the cornerstone of treatment. Commonly stimulant medications are prescribed to treat the hypersomnolence. These agents frequently cause systemic effects from sympathomimetic properties of the medications. Newer agents have been shown to promote wakefulness without the visceral side effects of traditional stimulant medications. Another common abnormality which can cause EDS is the presence of Periodic Limb Movements of Sleep (PLMS) ICD# 780.52-4. Often this condition occurs without the patient’s knowledge, and the patient does not fully awaken from these brief muscle contractions. In the absence of full awakening there can still be the precipitation of micro-arousals which fragment sleep and result in daytime sleepiness. Frequently, there is an associated symptom know as restless legs, otherwise known as the Restless Leg Syndrome ICD# 780-52-5 . This disagreeable creepy crawly sensation that patients experience in their legs and feet, while lying in bed attempting to go to sleep, can prolong the initiation of sleep (sleep initiation insomnia). This should be recognized by the history and treatment in clear cut cases can be initiated without polysomnography, provided there is no suspicion of co-existing OSA. A number of medical treatment approaches have been recommended for this problem over the years. Currently the leading treatment approach is with dopa agonists medications similar to those used to treat Parkinson's disease. Insomnia can be broken down into two main categories. Sleep Initiation Insomnia, in which the patient requires more than 30 min. to fall asleep on a regular basis, and Sleep Maintenance Insomnia, in which the patient falls off to sleep in less than 30 minutes but awakens throughout the night. Sleep maintenance insomnia is usually a "secondary insomnia" in that it is the result of some other medical or psychiatric condition. Two examples would be PLMS and OSA, in which rather than an arousal, the disrupting event causes a complete awakening. Sleep Initiation Insomnia can be either primary or secondary. An example of a secondary sleep initiation insomnia would be restless leg syndrome (previously discussed). The primary sleep initiation insomnias fall into a spectrum from idiopathic insomnia to psycho physiologic insomnia. The theoretical basis for this primary disturbance in sleep initiation is that these individuals have a decreased propensity to fall off to sleep due to some inherent biochemical predisposition. Those most effected present with this sleep initiation complaint during childhood. Usually multiple family members are similarly effected, and there are no psychosocial factors identified to explain this problem. Most individuals with primary insomnia fall short of this extreme degree of lowered sleep propensity and are more appropriately labeled with the diagnosis of Psycho physiologic Insomnia (ICD # 307.42-0). These individuals present with their insomnia during adult life. They to have a decreased propensity to fall asleep (not to the extent of the idiopathic insomnia patient) but it is not until a transient sleep disturbance occurs, disrupting the delicate balance in these individuals, which results in a perpetuating decline of sleep initiation along with the development of improper sleeping habits (sleep hygiene). This problem usually exists for many years before the individual presents to a physician for help. Historically speaking the deficient knowledge base of sleep disorders of most physicians has resulted in incorrect treatment recommendations for patients with Psycho physiologic Insomnia. These patients frequently take naps during the day or sleep late in the morning to "catch up" on lost sleep, or regularly take sleeping medications at night to fall asleep. These and other poor habits are referred to as poor sleep hygiene. Have a regular wake up time, seven days a week. Avoid caffeinated beverages after lunch, and avoid drinking alcoholic beverages in the evening before bed. Set aside a stress or worry time several hours before going to bed to plan the activities of the next day. Learn to relax and use relaxation techniques just before going to bed. Use the bedroom only for sleeping. Avoid watching TV. or doing work related activities while in bed. If you are not tired get out of bed and only go back to bed when your sleepy. Avoid watching the clock when your in bed. Further explanation of these sleep hygiene suggestions can be obtained on request. Patients with sleep initiation insomnia DO NOT NEED polysomnographic sleep studies. There is no sense obtaining a sleep study on these patients, because the patients usually do not sleep and the information is usually of no benefit. On the other hand, a test called actigraphy has proven useful in monitoring and treating these patients. Actigraphy is a method of activity monitoring that allows the clinician to check on the patient’s compliance with some of the sleep hygiene recommendations. If the insomnia is from the Restless Legs Syndrome, then treating with L-dopa or dopa agonist medications should be the first approach. If the patients Insomnia if from Psycho physiologic Insomnia, then allowing the patient to use a sedative hypnotic on a PRN basis is ok, but this should not be done in replacement for improved sleep hygiene. The type of medication used should ideally be one with quick absorption and a short half life so that the patient does not feel sedated in the morning. Now let us review a set of questions which can be used for obtaining a sleep history. While waiting to fall asleep do you feel an unsettled or restless sensation in your limbs (i.e. legs)? (For Restless leg syndrome). 3) If so do you feel that moving your limbs temporarily relieves this sensation? (For Restless leg syndrome). It can be recognized that these questions are directed towards obtaining information related to specific sleep problems. Let us go through these questions to point out the relevance for extracting information regarding a patient’s sleep complaint. 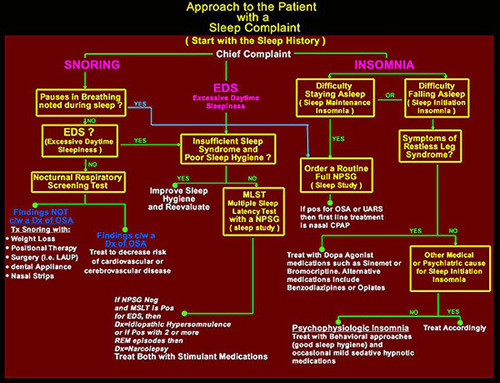 This overview is by no mean a comprehensive discussion on how to approach the patient with a sleep disorder, but it does address the majority of problems confronted by the general health care practitioner. 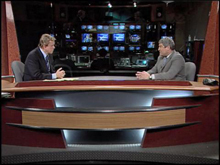 Parasomnias such as REM behavior disorders are not covered in this discussion. This discussion is meant to give the Primary Care physician, who has never been trained in the field of Sleep Medicine, a basis by which to approach the more common sleep complaints. Use stress management in the daytime. o Avoid unfamiliar sleep environments.